Tissue paper crafts are not only for children. Extravagant tissue paper crafts have become popular decorations in weddings, baby showers, and other special events. Tissue paper pom poms, made in the same fashion as Mexican fiesta flowers, appear to float in the air when hung by clear filament thread. Tissue paper pom poms are very popular for wedding decorations, baby shower decorations, or just for any party. Mexican Fiesta flowers have stems to put in vases or lay on tables. Find a color theme for your event, and buy tissue paper in all the varieties of those colors you wish. Stack eight sheets of tissue paper, alternating colors if you wish. Starting with the 20-inch side, fold the tissue paper in one and a half-inch accordion folds. Crease each fold sharply. Snip each end of the tissue paper, either pointed or rounded. Rounded ends will make the pom pom look like a large flower; pointed ends will make it look like a star burst. Wrap the floral wire around the center of the tissue paper for the pom pom, but do not bunch up the paper. It should lie flat. Twist the floral wire to secure. Use pipe cleaner instead of the floral wire if you are making a Mexican Fiesta flower. Separate the tissue paper layers, pulling them away from the center one at a time. Make small stained glass tissue paper crafts for special holidays or occasions. Use the black cardstock to cut out shapes for your stained glass. During the holidays, you can make bells, stars, Christmas trees, or other holiday symbols. For a child's animal themed birthday party, have each child make a stained glass animal. Use the scissors to cut out the center of each of the shapes in the cardstock. Glue one thin piece of tissue paper to the back so that it looks like a mini-stained glass you can hang on your wall. Piñatas are a fun party tradition in many countries. The piñata is hollow in the center and filled with candy and goodies to gather up as party treats when the piñata is broken. Most piñatas are decorated with tissue paper. The following tissue paper craft piñata is simple and easy to make and is fun as an activity at a kid's party. Fill the lunch sack with candy and treats, leaving about one inch of space at the top. The bag may get too heavy with so much candy and treats, so take up space by wadding up newspaper and putting that inside the bag as well. Fold the top of the lunch sack down, and staple it shut. Punch two holes in the top and thread a piece of string or yarn through the top to hang the piñata later. 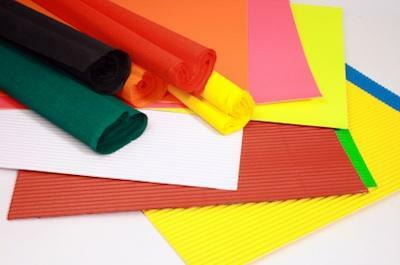 Cut strips of tissue paper in varying colors about three inches wide. Snip one edge of the tissue paper halfway up to make a fringe for decoration. Glue the other edge of the strip to the bag. Layer more tissue paper around the bag until it is completely covered. Hang by the string, and let children hit it with a plastic bat until it breaks open, releasing the candy. Tissue paper crafts are inexpensive and easy. Tissue paper comes in many colors and patterns, which make tissue paper crafts creative and fun!